1. Preheat the oven to 350 F. and grease an 8×8 pan or pie dish.2. Combine the water, quinoa and salt over medium-high heat. Bring it to a boil, cover and simmer for 15 minutes, or until most of the liquid has been absorbed. Remove from heat and fluff the quinoa with a fork. Place the broccoli florets on top of the quinoa, cover, and let the saucepan rest on the warm burner for about 5 minutes. 3. Beat the eggs then add the milk and pepper, whisking until combined. 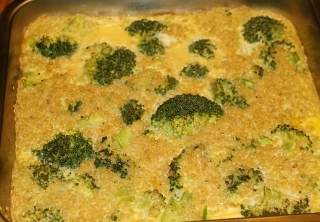 Place the quinoa-broccoli mixture in the prepared casserole dish. Pour the egg mixture over top, mixing gently if neccessary. I let this refrigerate over night and my husband put it in the oven before he got ready for work and ate it for breakfast. He really liked it and would like me to try swiss chard next time. 4. Bake for 35-45 minutes, or until golden brown on top. Let it cool for 10 minutes before cutting into slices.